The sculpture fountain is a perfect combination of sculpture and fountain, so it is more perfect, richly colorful and statically-dynamically coordinated in its modeling. Its appearance full of vigor and vitality has dramatically improved its entertainment and interests for people. The sculpture creates special atmosphere for both natural and artificial places. Its unique artistry and infectivity can give a fascinating art world for people in spiritual enjoyment. As a result, people can maintain mental tranquility and adjust their life's frequency in such wonderful space of nature and art, which is really a life pleasure. Established in 1984, Guangzhou Water Art Fountain Irrigation Garden Co., Ltd is a professional manufacturer of sculpture fountain in China. In addition to sculpture fountain, we still provide customers worldwide with music fountain, garden fountain, square fountain, mist fountain, laser fountain, waterfall rockery, floating fountain, running fountain, wall fountain, digital water curtain, creek water feature, outdoor water fountain, direct jet nozzle, central upright fountain jet, morning glory nozzle, dandelion fountain nozzle, rotary nozzle, flat nozzle, fog nozzle, fan nozzle, water sphere and hemisphere nozzle, aerated nozzle, etc. We have built water features for Spring Festival Evening Gala of China, China Art Festival, and many other Chinese literature and art activities. And so far, we have set up long-term cooperation relationship with customers around the world, such as Malaysia, Brunei, Tajikistan, Saudi Arabia, UAE (United Arab Emirates), and many other countries in Central Asia and Southeast Asia. 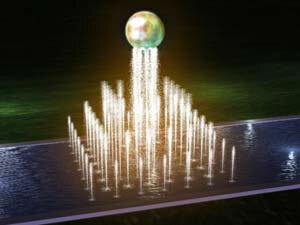 If you're interested in our sculpture fountain, please contact us freely. Running FountainThe running fountain is typically built in broad places, such as rivers, lakes, oceans, squares and the like. And it is a combination of straight nozzles.